Doctors and scientists with an interest in myeloma and related diseases have been meeting every two years since 1987 for an international conference called the International Myeloma Workshop (IMW). The 13th conference was held in Paris in May 2011 and organized by Professors Jean-Paul Fermand (Saint-Louis hospital, Paris), Thierry Facon (Claude Huriez hospital, Lille) and Philippe Moreau (Saint-Jacques hospital, Nantes). Previously, in 2008, they had set up a non-profit organization, Paris Myélome 2011, whose objectives were to organize the IMW and promote all research on myeloma, other monoclonal gammopathies and associated disorders. IMW 2011 was attended by over 3000 doctors and scientists and its success spurred its organizers to continue the momentum. 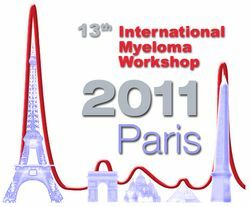 On 29 June 2011, at the annual general meeting of Paris Myélome 2011, it was decided that it would be dissolved and that a foundation would be set up to continue the objective of promoting research into myeloma and all types of monoclonal gammopathy. It was named the Fondation Française pour la Recherche contre le Myélome et les Gammapathies monoclonales (French foundation for research into myeloma and monoclonal gammopathies, FFRMG) and operates under the aegis of the Fondation de France, according to the terms of a contract signed on 16 December 2011. The primary objective of the FFRMG is to enable scientists or students to carry out research programmes on myeloma or other gammopathies in host laboratories in France or abroad. It also aims to contribute to and/or promote treatment, advocacy and the well-being of patients with these diseases. The FFRMG is managed by a Board of Governors, which comprises its three founding members (Professors Jean-Paul Fermand, Thierry Facon and Philippe Moreau), Vivien de Gunzburg, the MP for Loire-Atlantique Dominique Raimbourg, and Professors Jean-Claude Brouet, Jean-Pierre Grunfeld and Benjamin Van Camp. The board’s first meeting was held on 16 December 2011, at the Fondation de France headquarters, in the presence of one of its representatives, Frédéric Bérard. Professor Jean-Paul Fermand was appointed president of the FFRMG. Vivien de Gunzburg was appointed treasurer.